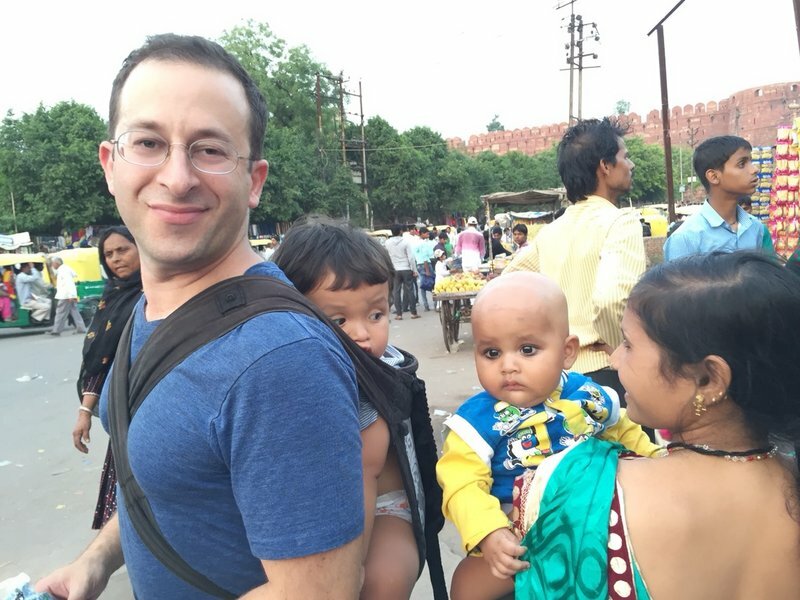 Only showing entries about agra from Babies in backpacks. 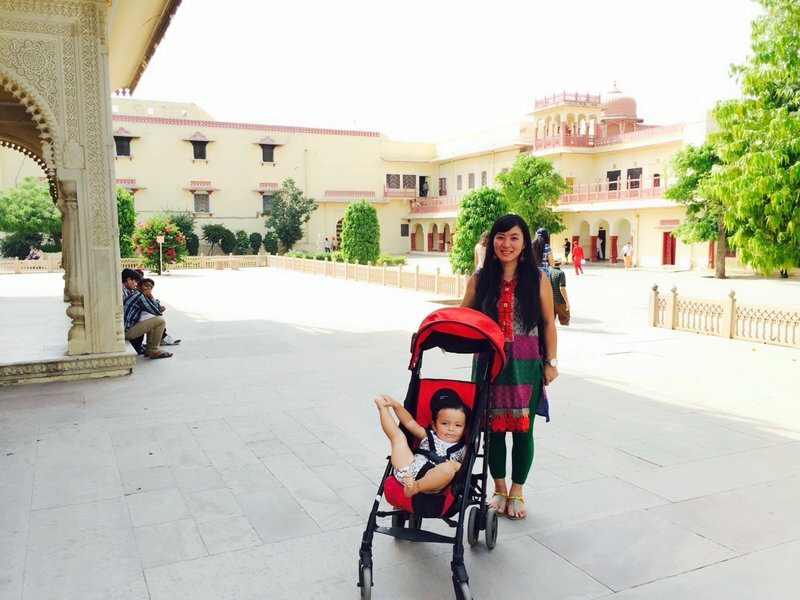 View entries about agra from all Travellerspoint blogs. 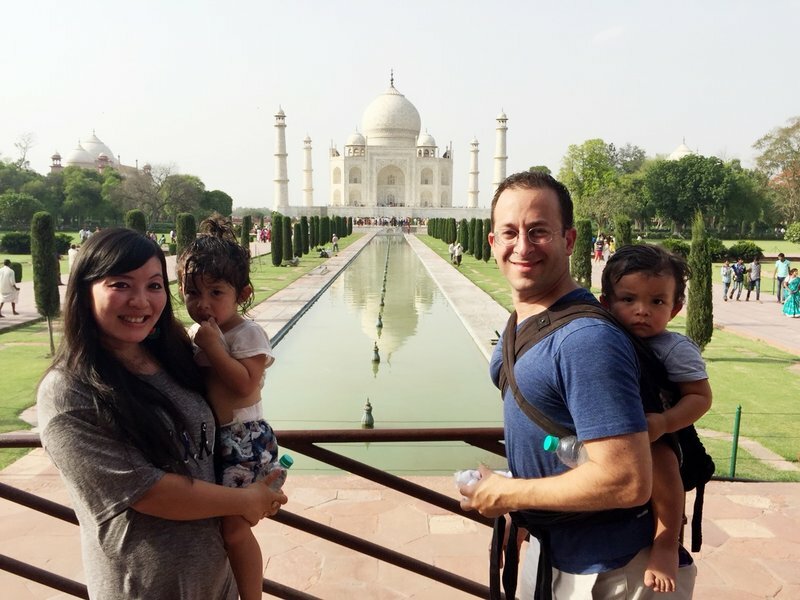 We had originally planned to visit Delhi and the Taj Mahal, so I had reserved one night in a hotel in Agra before we left. 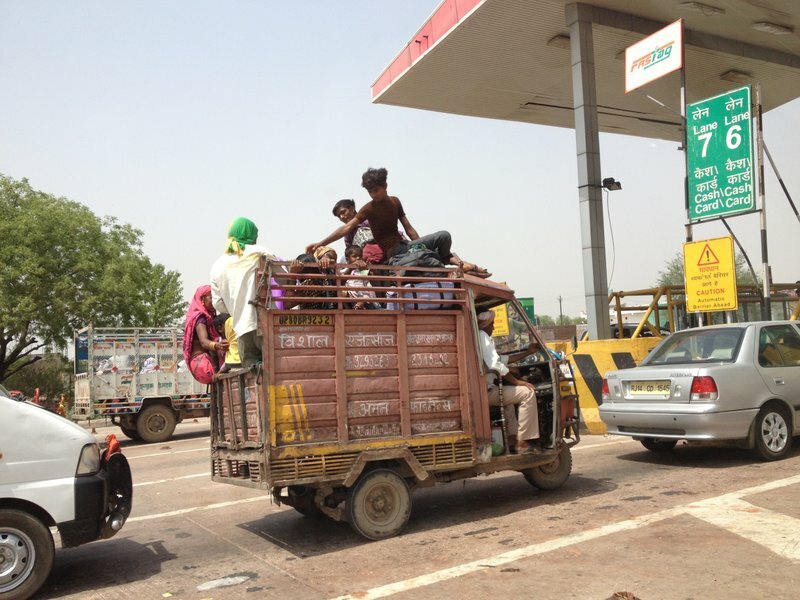 We figured we would sort out our transportation to Agra once we arrived. 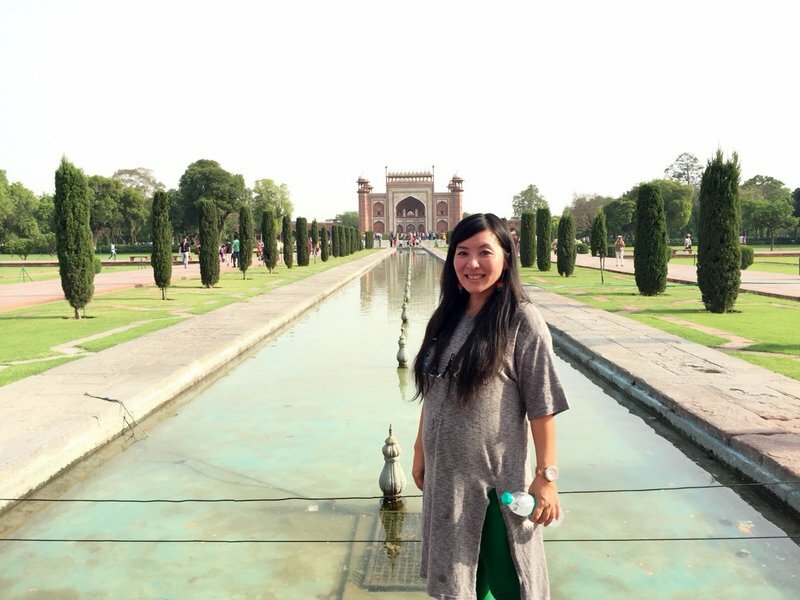 At the Tara Palace in Delhi, the manager had made us a reasonable offer to send us on a three day tour of Jaipur and Agra with a personal driver. 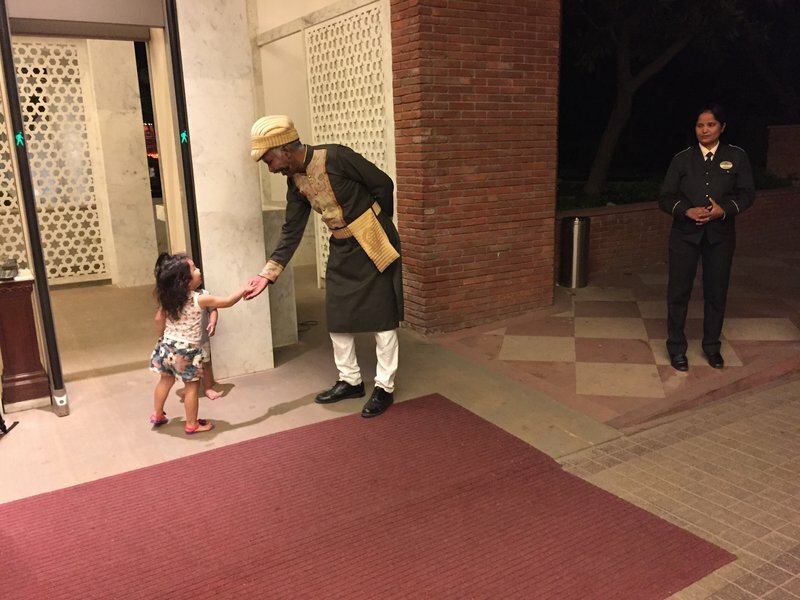 I didn't know much about Jaipur, but we had already seen most of what we wanted to in Delhi so at least it would be something different. We set off fairly early in the morning on what would prove to be a five hour drive in an old car with weak air conditioning. 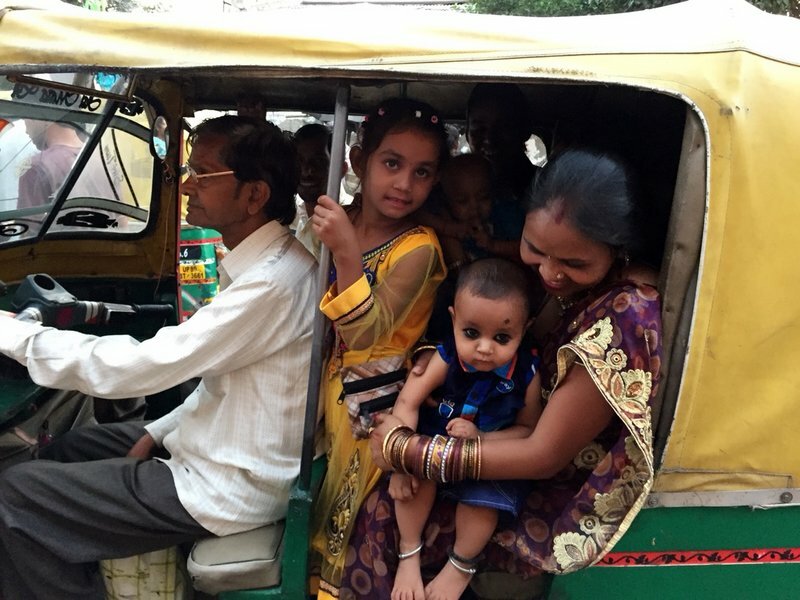 We didn't have car seats for the kids, but fortunately the highway was in very good condition and our driver was very conservative. At least our kids were safer than the ones in this vehicle. 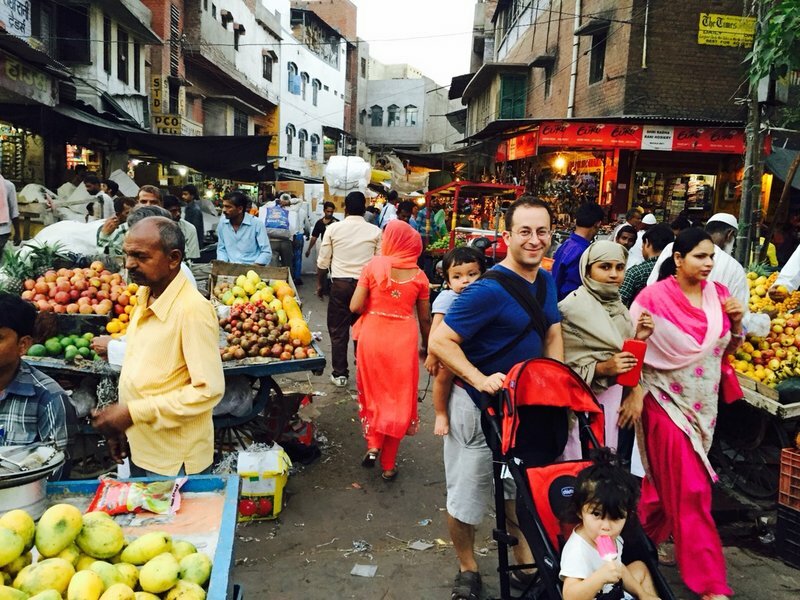 We got to experience Delhi traffic as we departed through Chor Bazaar in the center of the old city. Our highway lunch stop was a bit of a misfire, as I quickly realized that the restaurant was very overpriced with bland food and the only people eating there were Westerners on a similar itinerary to ours. We didn't have any choice at that point, but once we got back to the car I made it very clear to our driver that we weren't going to be earning him any more commissions at tourist stops. From on now, we were going to eat where the Indians ate. 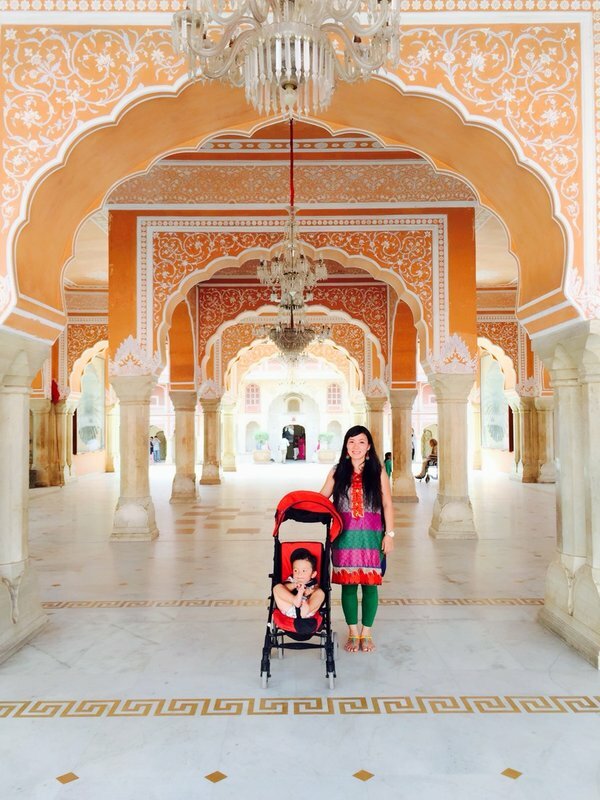 Once in Jaipur we drove straight to City Palace, a complex of ornate pink-hued palaces and temples spread over a wide area. It was pleasant enough to walk around in, aside from the brutal heat which was worse than anything we'd experienced in Delhi. 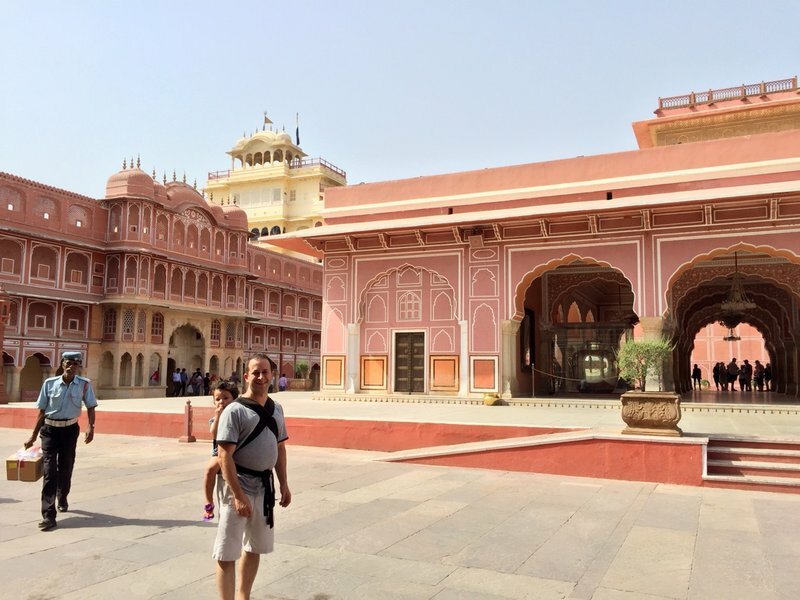 After an hour we retreated to the main road where we encountered the Hawa Mahal, a 18th century palace whose rear facade resembles a pink beehive. The ornately-latticed windows were reportedly designed to allow the woman of the royal household to watch the goings on in the street below without being observed. 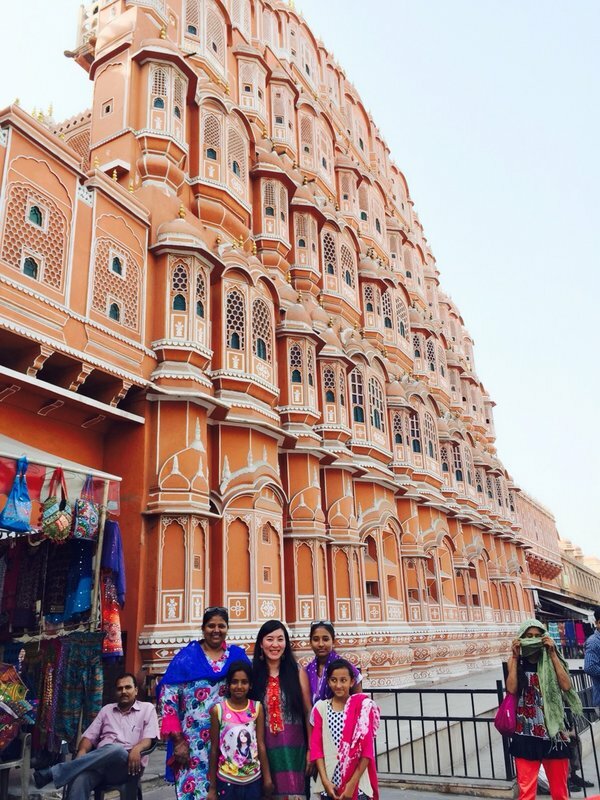 We spent a little more time walking up and down Hawa Mahal Road checking out various street vendors and buying a few snacks, but it was really too hot to enjoy ourselves so we drove to our hotel and checked in. The air conditioning and cold drinks were a god send. In the evening we had a reasonably good restaurant meal and then went to the Johari Bazaar, a large complex of shops where the main emphasis was jewelry. We weren't very interested in that, but there were enough food vendors and other things to see to keep us interested for a while. 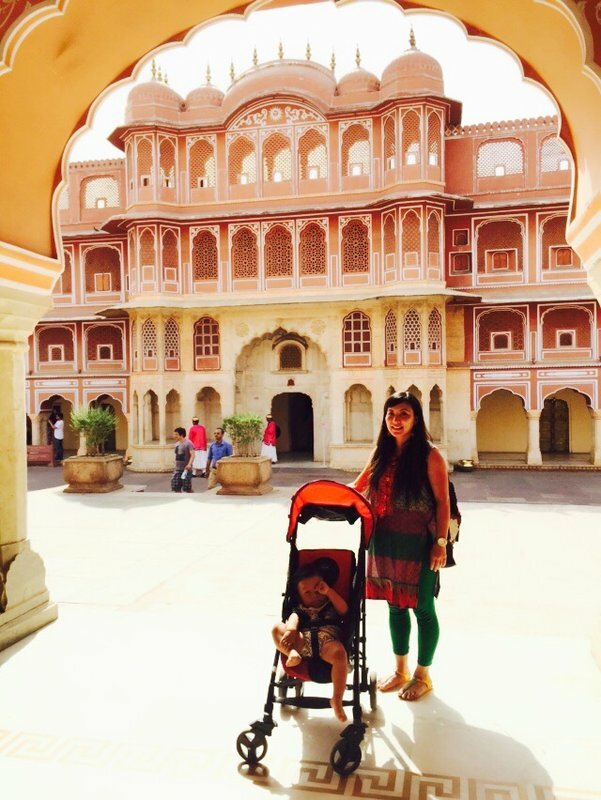 We weren't sorry to leave Jaipur for Agra the next morning. 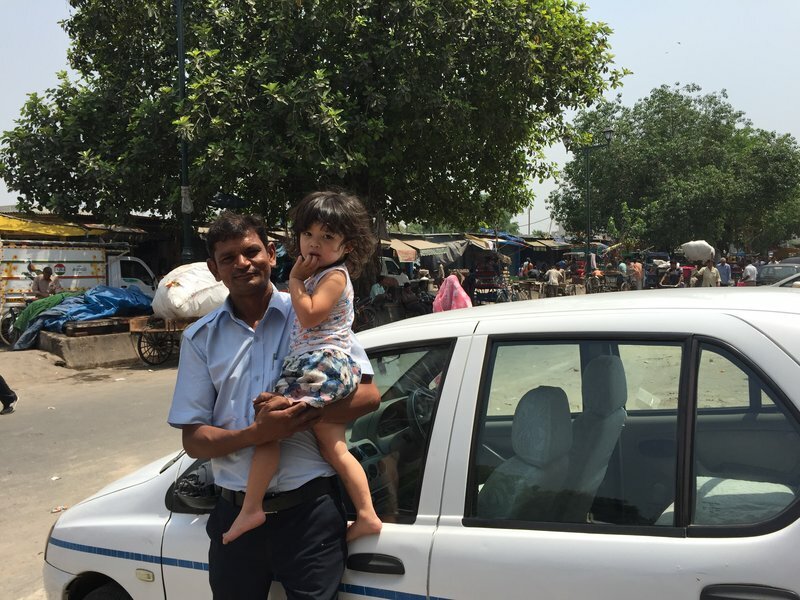 I'm sure there's a lot we didn't see, but in terms of markets and street life the city was a pale shadow of Delhi. 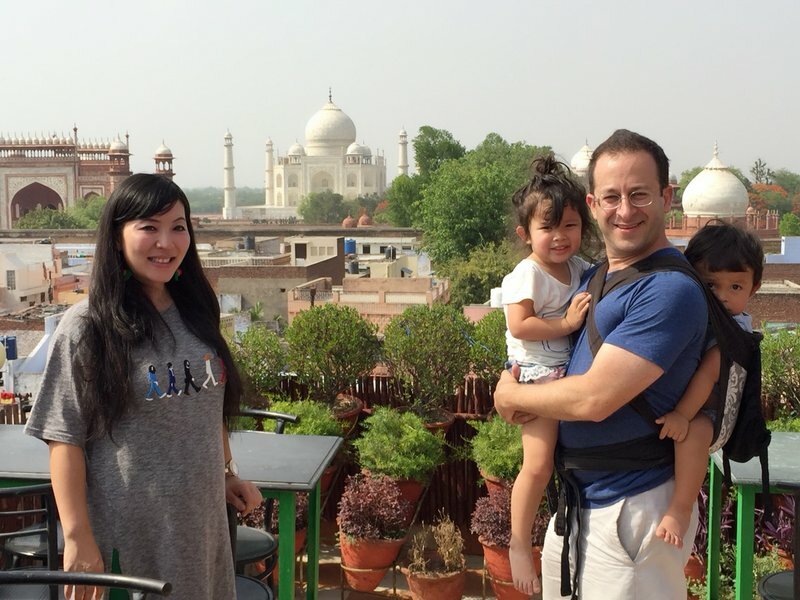 Once we arrived in Agra, we didn't have to wait long for our first sight of the Taj Mahal. Our driver dropped us off at a rooftop cafe I'd read about in the crowded neighborhood south of the palace and we enjoyed a perfect view of the surreally beautiful building. It was a fine appetizer for our visit. 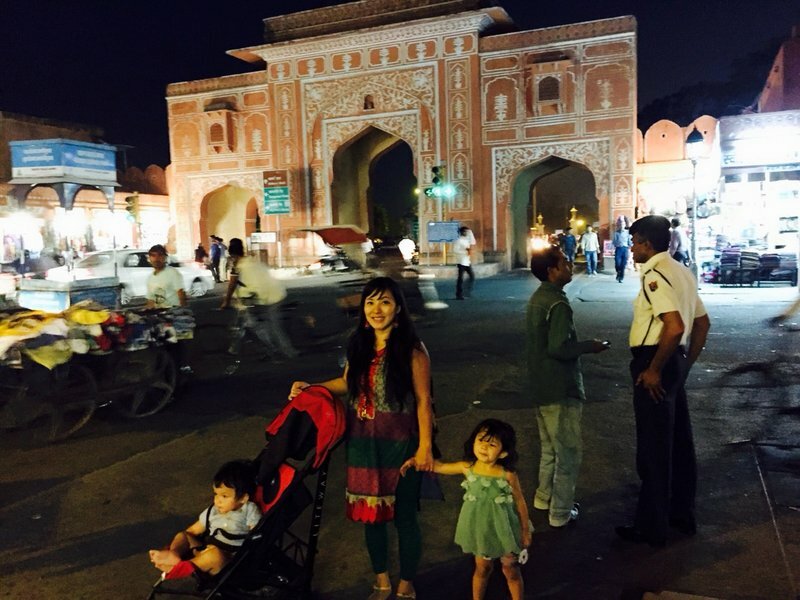 We walked north through the busy bazaar south of the Taj Mahal to get to the Great gate, Darwaza-i rauza. If I hadn't seen the actual mausoleum from the cafe rooftop, I might have thought this formidable red sandstone and white marble structure was the Taj Mahal itself. Once through the gate, we were face to face with the beautiful white mausoleum. at the far end of a long rectangular fountain surrounded by short cypress trees. At this point I allowed myself a moment to savor our accomplishment. We'd made it here with two small children who could barely walk on their own, and Mei Ling pregnant to boot. One by one we were seeing the most incredible sights the world had to offer, and we hadn't let anything stop us. 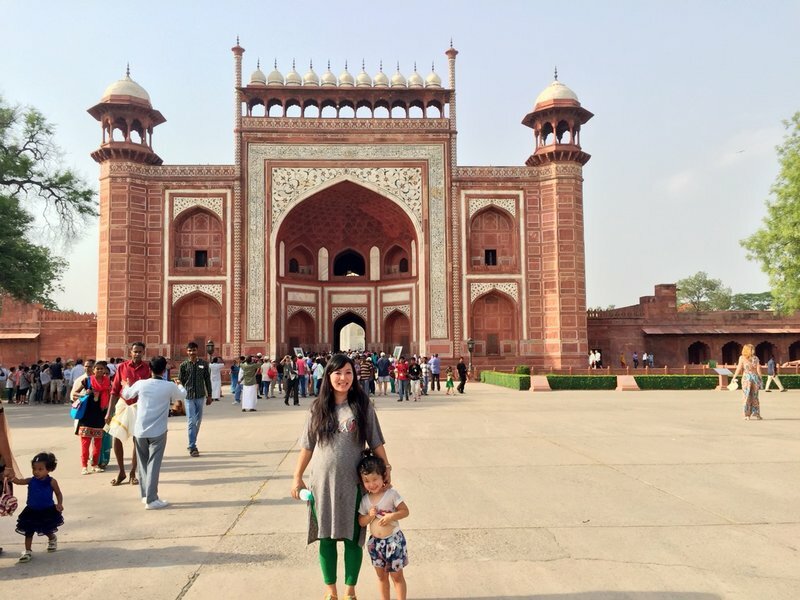 The exterior of the mausoleum was amazing up close as well, with complicated architectural designs and detailed, colorful decorations in the white marble. 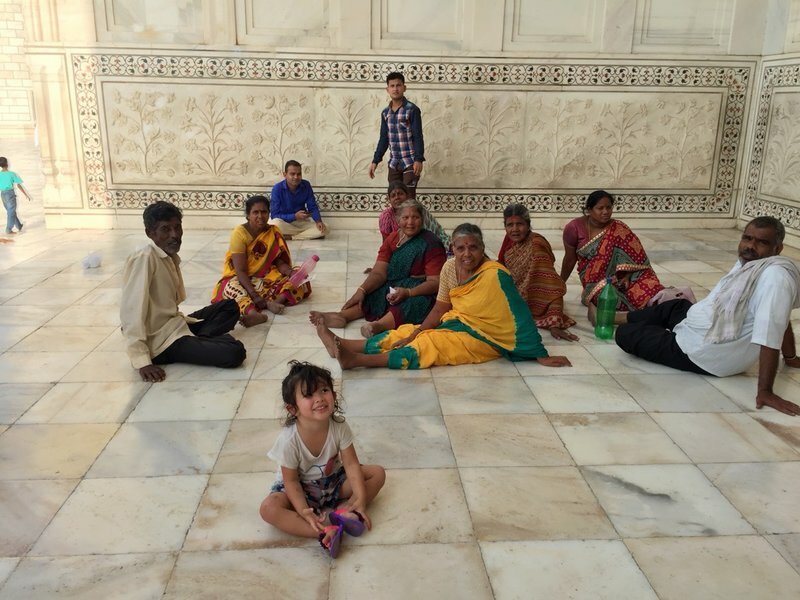 Around the mausoleum was a wide platform of white marble tiles where Indian visitors sat in groups. 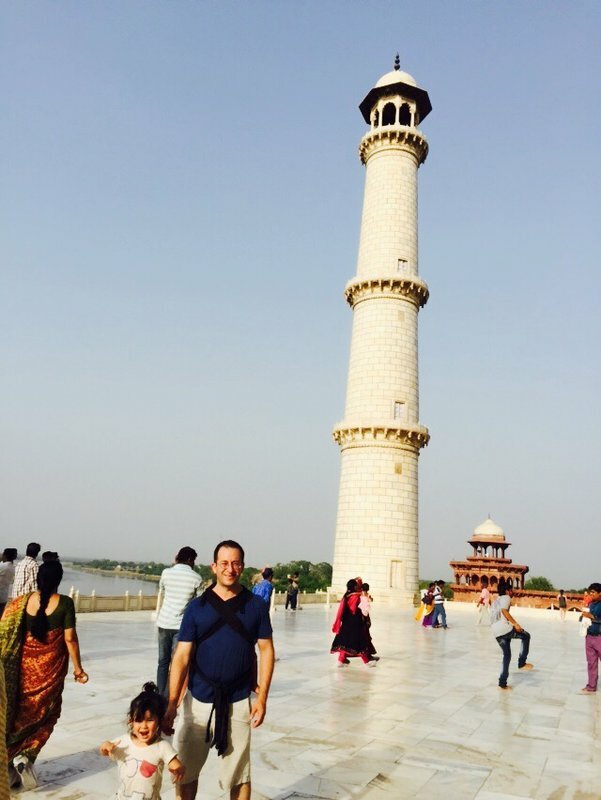 The four tall white minarets at each corner of the platform added to the sense of majesty and serenity. The crypt chamber was surprisingly plain, in keeping with the Muslim prohibition against elaborate decoration of graves. Between the crowds, dimness, and lack of memorable detail we didn't find any pictures worth taking once inside. As always, the kids were a big hit with the Indians, who often asked if they could take pictures of each other holding Ian. 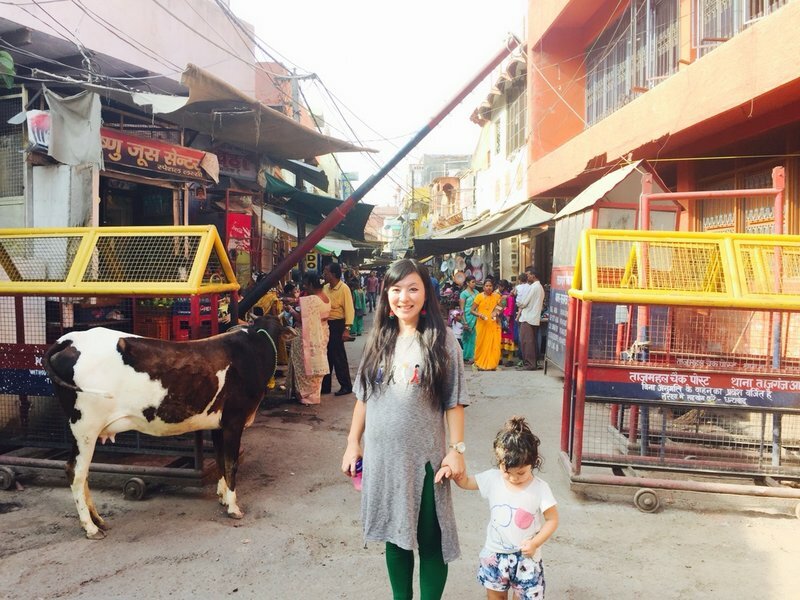 In the afternoon we visited the Kinari Bazaar, a large market next to Agra Fort. 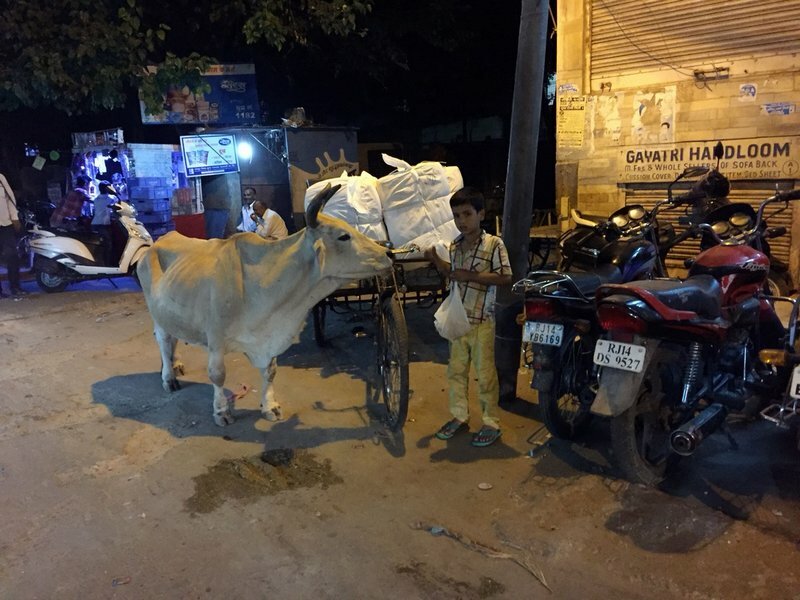 It was just as gritty as the markets in Delhi, but it felt great to be in the mix of activity in the street and part of the daily rhythm of Indian life. I was briefly tempted by a sugar cane juice vendor, but I had second thoughts after seeing the thick blanket of flies covering the crushed cane. 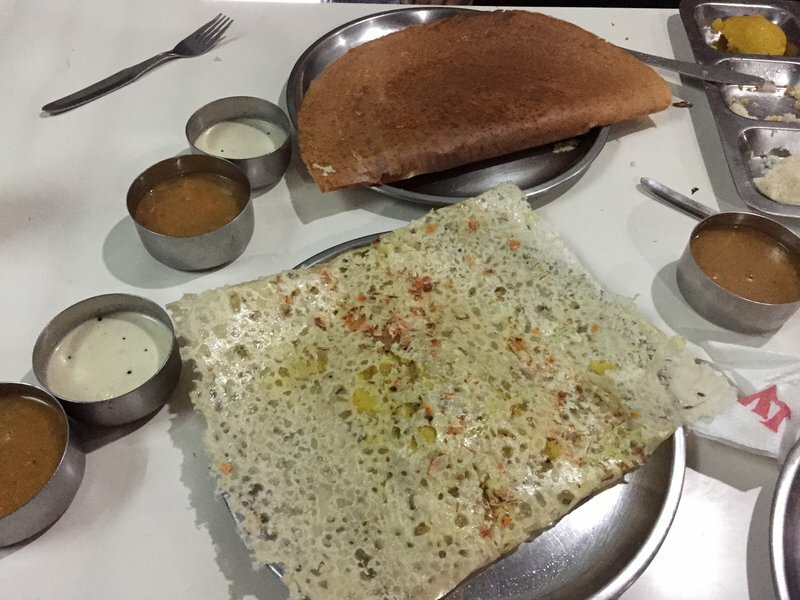 Our driver had a lot of difficulty finding the restaurant I'd chosen from TripAdvisor, but eventually we had a pleasant meal of the local specialty which was reminiscent of savory crepes filled with meat and vegetables. 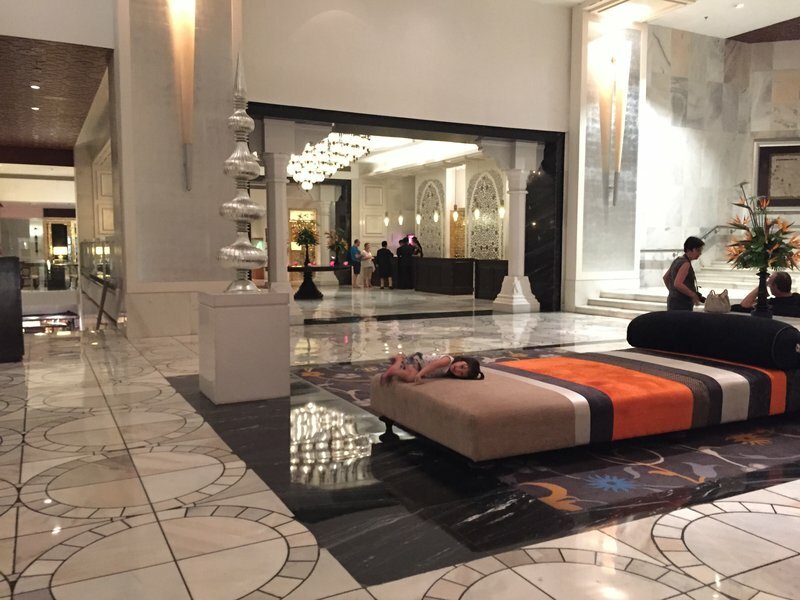 I'd reserved a deluxe hotel room at a four star hotel in Agra before leaving Miami, but it was still very inexpensive compared to even an average hotel in the US or Europe. 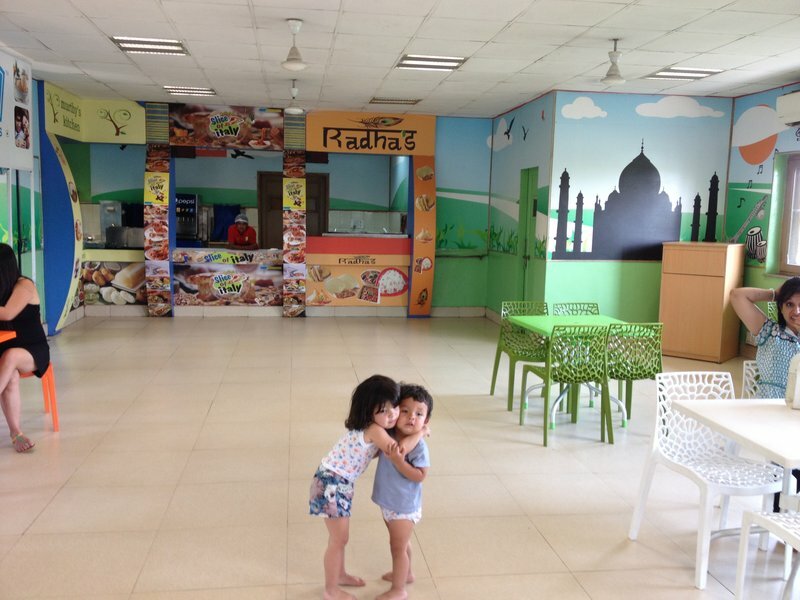 The kids got a kick out of the lavish interior decor and the friendly, uniformed staff. Our driver did much better with the highway stop on the way back to Delhi the next morning. We put together a good lunch from a mix of cheap stalls attached to the service station. Cleo had bonded quite well with our driver at this point. As we approached Delhi, we could see a very impressive-appearing temple on the eastern bank of the Yamuna River. Since our contract extended to the end of the day, we asked our driver to take us there once we'd had a chance to freshen up at the hotel. 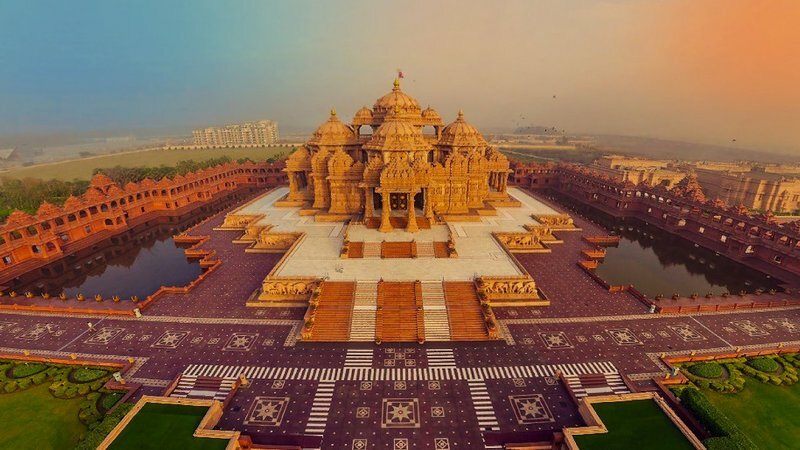 The temple turned out to be the Swaminarayan Akshardham, a gigantic complex whose construction had been completed only ten years earlier. Unfortunately I can't present any pictures of this amazing building because the guards were extremely strict about enforcing a no photography policy. Everyone was patted down at the entrance to be sure they weren't bringing in a camera or cell phone. Signs were posted everywhere threatening horrific penalties for attempting to smuggle in any such device. 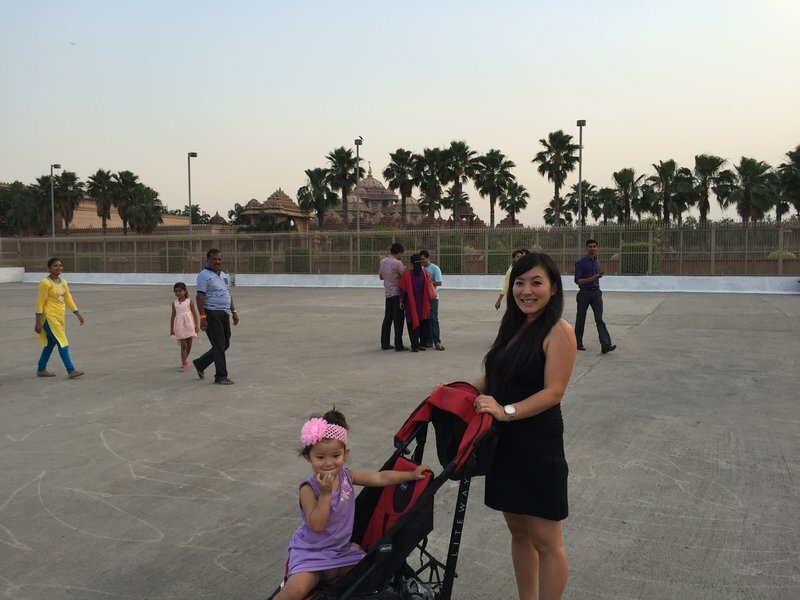 The only picture I have of us at Akshardham was taken from outside the perimeter fence. The main temple, or Mandir, or Akshardam is one of the most awe-inspiring structures I have ever seen. 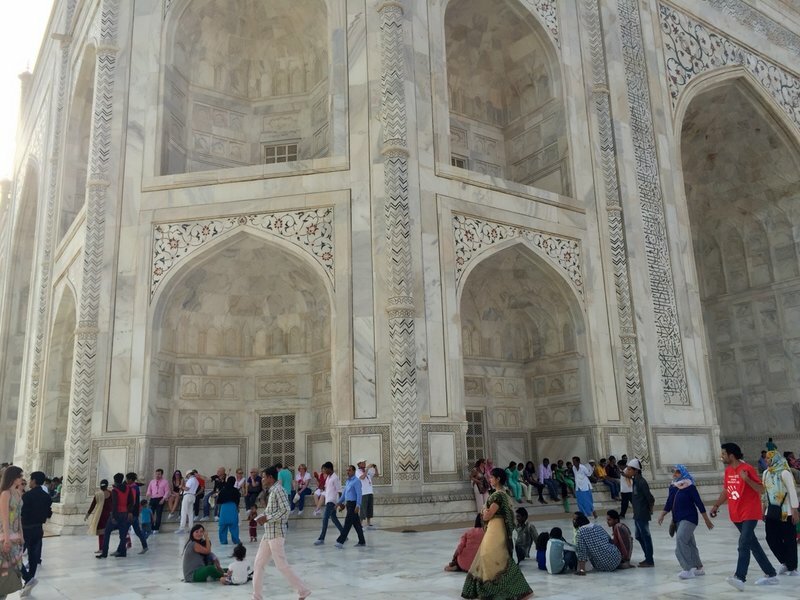 In terms of pure visual effect, it vastly overshadows even the Taj Mahal. 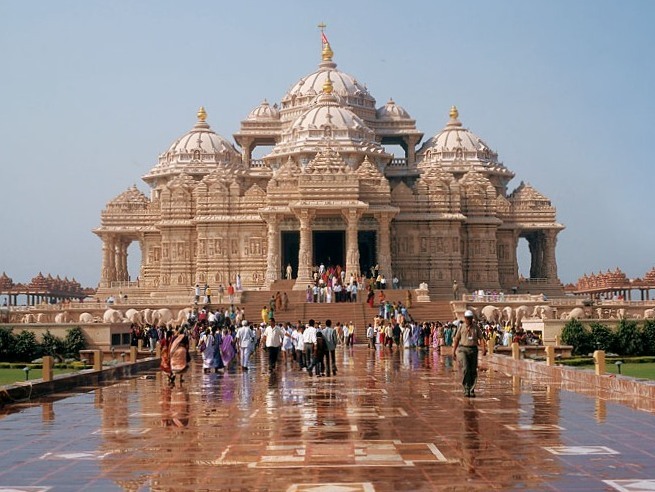 The temple is constructed entirely from the highest quality pink sandstone and white marble, and cost about 60 million dollars to build. In the US, it probably would have cost five times that. Every inch of the stone was decorated with intricate carvings. The opulence of the complex is testimony to the enormous wealth of the Swaminarayan religious organization, the Hindu sect that built the temple. As with the grandiose cathedrals we've seen in countless poverty-stricken Latin countries, I couldn't help wondering why the enormous wealth amassed by religious organizations couldn't be used to provide genuine assistance to the helpless members of the communities rather than these opulent and ultimately useless edifices. It wouldn't surprise me if after a couple of hundred years have erased the stain of modernity, Akshardam becomes more well-known as one of the architectural wonders of the world than the Taj Mahal. 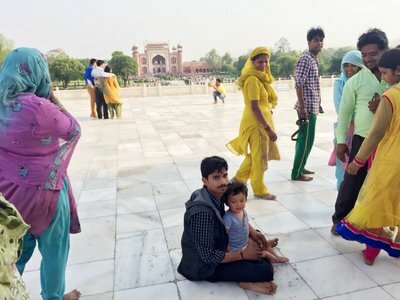 Since we weren't allowed to take any photographs, I ripped a couple of pictures from the web to try and illustrate the magnificence of this temple. The next morning we were taken back to the Delhi airport for our flight to France. 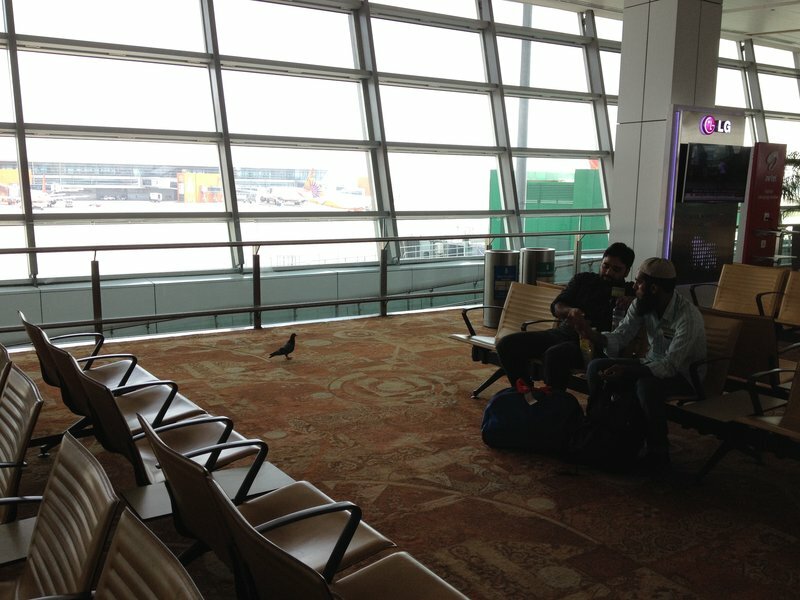 Our last memory of Delhi was of the pigeons flying around inside the departure area.